OK, everybody get this song in your head… Gary, Indiana, Gary, Indiana, Gary, Indiana, not Louisiana, Paris, France, or Rome. OK… now substitute Gary Indiana with Bisbee Arizona. Everybody got it in his or her head? I will proceed then. Bisbee, Arizona is a small artsy town south of the tourist trap Tombstone, Arizona. The town made its money off of copper mining while Tombstone was all about silver. We never would have known about Bisbee if the Tombstone/Bisbee combo weren’t listed in “500 Places to Take Your Kids Before They Grow Up” (the book I always mistakenly refer to as “500 Places to Take Your Kids Before You DIE” – which is really morbid). First, we have to discuss Tombstone. Let’s get it right out there that the kids loved the OK Corral reenactment of the famous gunfight complete with actors and booing and cheering of the ‘heroes’ and ‘bad guys.’ It was loud (real blanks in those guns) and hokey and overdone and all that would have been fine, but the admission was 10 bucks each (no discount for kids). (Video link not filmed by me and I don’t actually have the bandwidth to watch it all, but it looked right) I looked around the audience and calculated they made about $1500 from our half filled show on a quiet Tuesday. They do these performances THRICE daily – probably more on the weekends. The show lasted about 30 minutes AND then the actors were asking for tips. Someone is making out like a bank robber from the Old West on that business. The rest of Tombstone is souvenir shops and old-timey photo booths – BUT they are all set on a cute boardwalk with western looking storefronts. There seem to be a plethora of folks walking around in period costume also. The kids got to shoot 6 paintball bullets out of a real gun in one of the stores ($3 each). Woo-hoo, the excitement just doesn’t end. One highlight was a diorama narrated by Vincent Price that was so 1950s it was fun. I don’t want to give away too many plot points, but the little plastic cowboy figure falling down after he was shot and then springing back up again as the diorama turns was a hit with David and me. Lord knows, I love a good diorama. * In summary, David and I weren’t huge fans of Tombstone, but the kids had fun. The next day we drove a short 30 minutes down to Bisbee, Arizona (cue chorus from song above). I loved this town! I want to move here. David is a little scared I’m serious, and likely I will forget about it in a few months, but the whole place just gave off a great vibe. It was finally summed up for me when I saw this bumper sticker. Everybody was super friendly (but not in a ‘we are here to take your money so we have to be nice to you’ way), there was a ton of fun artsy shops**, a great mining museum, Bennett and I ate a fantastic deli called the High Desert Market***, there was art everywhere you looked in every random corner, AND the town doesn’t get boiling hot in the summer. (They have a small monsoon problem, but what place doesn’t have some faults?). Everybody seemed to know each other and stopped to have a conversation. 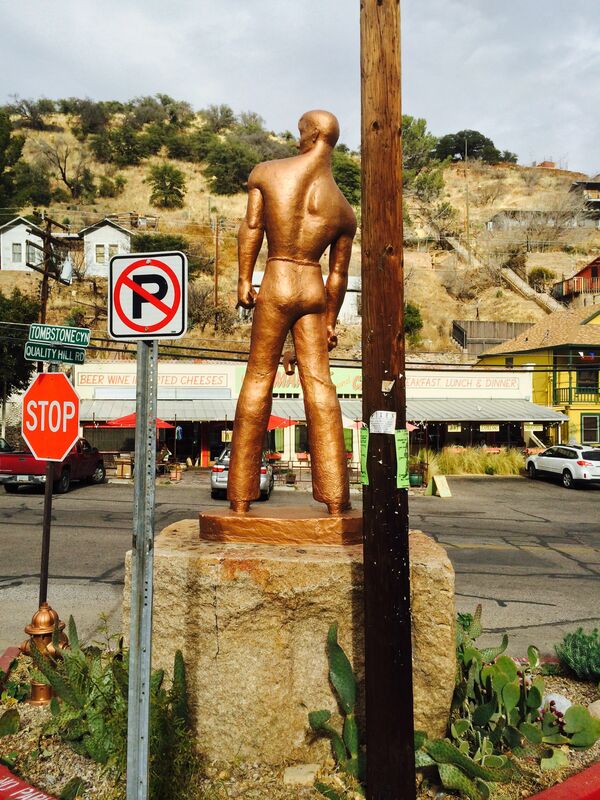 How can you not like a town that has this statue for the “Virile Copper Miners” or that their big fundraising event is the Bisbee 1000 that makes you run all the outside stairs around town? We didn’t even do the big tourist attraction, the Queen Anne’s Mine Tour, because we still felt a little entertainment budget ripped off from the day before, and it was also pricey. However, it does get good reviews and the tour guides are mostly retired miners. We stumbled onto a glass blowing shop where the artist had a sign on his chair that said, “Please don’t hesitate to interrupt me.” He was actively making a glass piece over the flames but he took the time to answer all of our questions even though it was pretty clear we weren’t real customers. He also had two nice dogs guarding the shop that we got to pet for a quick dog fix. In short, if you are ever in this area, glance around Tombstone and then drive on down and embrace the warmth of Bisbee. If David leaves me for a younger model when I’m 65, I’m moving down there. *I HATE homework assigned dioramas – especially when they are assigned to students as a mandatory project to describe a time in history or book or whatever. They can be on a list of 20 options of how to do a project, but never mandatory. Is This Vacation or Is This Life? A friend of mine told me that she hesitated texting me because “we are on vacation and she didn’t want to bother us.” I told her that was ridiculous because we aren’t on vacation; this is just our life for the next 7 months. I need my friends to text me when they have a random thought of brilliance, I need the ridiculous email chain showing a series of gorgeous pics of actors or the thought provoking one about rich parents volunteering. I need more of that. It makes me feel connected. I have awesome, amazing friends and I miss them. Facebook makes this much easier to stay connected, but Facebook is always about putting the best foot forward and never showing the embarrassing or too personal. I have to think about “vacation” though because, well, technically, we are on vacation – we are travelling, we are seeing amazing sights, 5 years from now when we look back, we will look at this as the RV Vacation. So, it’s vacation, right? On the OTHER HAND, it is life. The kids get haircuts, we have birthday celebrations, I’m still cooking and cleaning (and trust me when I think ‘vacation’ it does not involve me cleaning the toilet every other day). David met a family last night that is planning on traveling for the next 4 years. FOUR YEARS. They have 3 kids, 8, 6, and 3. The 3 year old isn’t completely potty trained. (OH MY GOD, THAT WOULD BE SO HARD. I love the age of our kids for this trip.) In David’s brief talk with them he found out it probably would have been fun to talk to them further. We seemed very similar in outlook about money and parts of life. * The dad works remotely (great post here on the care and feeding of your work at home husband). Are they on vacation? I would answer a no on that one. P.S. Many of my cooler blogging friends have musical interludes for their blogs. While writing this, all I could think of was the Go-Go’s “Vacation.” Further proof that I’m just not that cool. 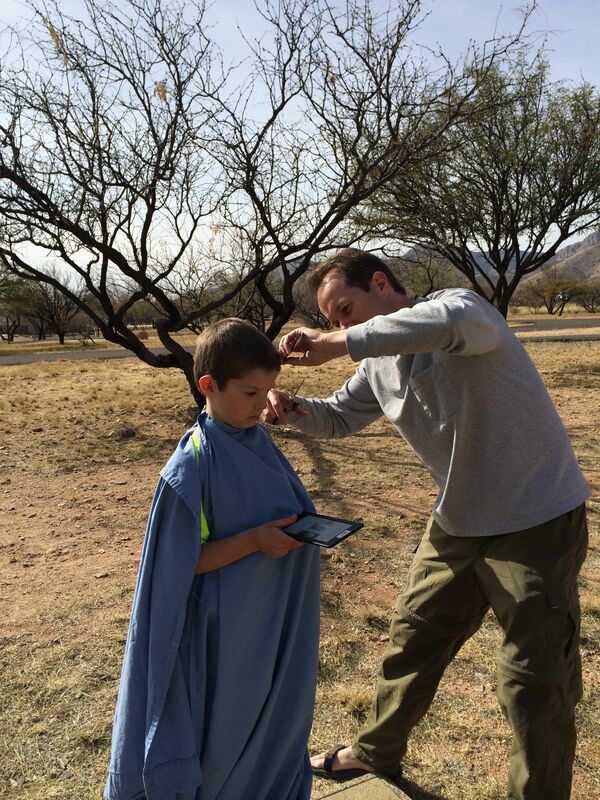 Some people might question it, but getting your Junior Ranger Badge qualifies as a homeschooling day. Not an hourglass, not a tie-fighter. Roman numeral 10. Gluten Free! Now that we are a whole 10 days into the real portion of our trip and starting to take the blogging seriously, I’m starting to wonder whether we shouldn’t use aliases for our kids’ names. David’s thought has always been – there is nothing on the blog that we want to hide from. It is us. I think that is a fair decision for us, but I’m starting to question it for our children. Shouldn’t they be allowed to create their own digital world? Does 15 year old Carter really need anyone to know that he used to sleep with a stuffed animal called Little Bear? Does job seeking 21 year old Bennett really want his employer to know that we used to call him Mr. Mayor because he is the only extrovert among us? One solution is to obviously take down the blog as they get older. However, I have seen other bloggers use aliases. I saw some cute ones last night, Data, Storybird, Monster Man, Cat and Dog. I’m not a network news watching doom sayer that thinks that crime is rising (it’s not) and that there are bad people around every corner (mostly super nice ones). However, now that the blog is being seen by non friends and family, I wonder about someone coming up to Bennett and saying “Hey, I hear you like rocks, come over to may scary van with no windows and I’ll show you some. Your mom and dad, David and Betsy, said it was OK. Your brother, Carter, is already over here.” Bennett is a pretty bright kid and we talk about different scenarios a bit, but he might fall for that one. I don’t see any of that as a likely occurrence, but it is a stronger possiblitity with a web presence than without one. What are your thoughts on aliases vs. real names for children? I’m going to send this to a few family bloggers too to get ideas. Having lived in Northern climes my entire life, the Southwest is a very otherworldly landscape for me. No forests, no rivers, no dirt. Joshua Tree National Park is an excellent example of all of this. It is Dr. Seuss-ville. One of the reasons this area is interesting is that it is the meeting/transition of two different deserts, Mojave and Sonoran. The actual strange looking Joshua Tree only grows in the upper Mojave sections of the park, however, the whole park is an big mix of cacti, Jumbo Rocks, creosote bushes, and sand. The rocks were a huge hit with the kids. They loved scrambling, scaling, conquering, clambering, and scaring their parents all over them. We joked that giant kids had been playing with stones and then got called in for dinner by their giant parents. They didn’t clean up and these rock piles were the result. I found an indentation in a low rock on the backside of one of the outcroppings and enjoyed a vista and some quiet moments of nature observations while the boys performed more death defying climbing with dad. David: You playing U2 on your iPhone so that the kids could hear one of the things that made the park famous, the rocks, and that view from Keys Vista. Carter and Bennett: The rocks. Travel Notes: The Keys View is not to be missed. (Could see all the way to Mexico!). There also appear to be dirt roads you can take during daylight hours – didn’t know about that until the end. The roadside exhibits (pull off to read the signs) were actually interesting and informative to those of us who know little about deserts. No food for purchase in the park. You can do a loop through this park from Palm Desert – go in on one end and come out the other. The kids have been playing with stop motion videos with the iPad app Stop Motion. First they did a thank you note for a few of the gifts they received, then they made some silly ones with monsters. The impressive thing about that one is how they carefully made sure their hands weren’t showing as things “flew” through the air. Bennett played around with “hello” in a sweet 14 second video.